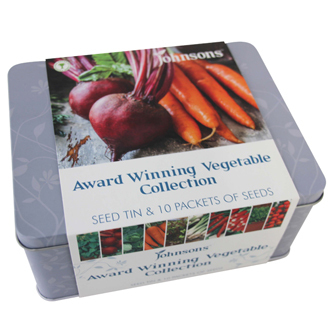 A collection of award winning vegetable seeds in a seed tin, to give you fresh flavours from your garden. 10 packets of herb and vegetable varieties, to be sown throughout the year. The veg tin contains one packet each of Basil Lemon, Beetroot Boltardy, Cabbage Greyhound, Carrot Autumn King 2, Lettuce Red and Green Salad Bowl Mixed, Onion (Spring) White Lisbon, Pepper (Sweet) Friggitello, Radish French Breakfast 3, Spinach Lazio F1 and Tomato Alicante.